Our cheat sheet is available here, and BitBull Capital Research’s market commentary is below. Today, Bitcoin completes another year; one of its most bearish returns since its inception 10 years ago. Yet even with its decline in value, Bitcoin has returned an average of 993% annually since inception. At BitBull Capital, we diligently follow and research crypto’s returns, informing our fund of funds’ diligence of crypto hedge funds. 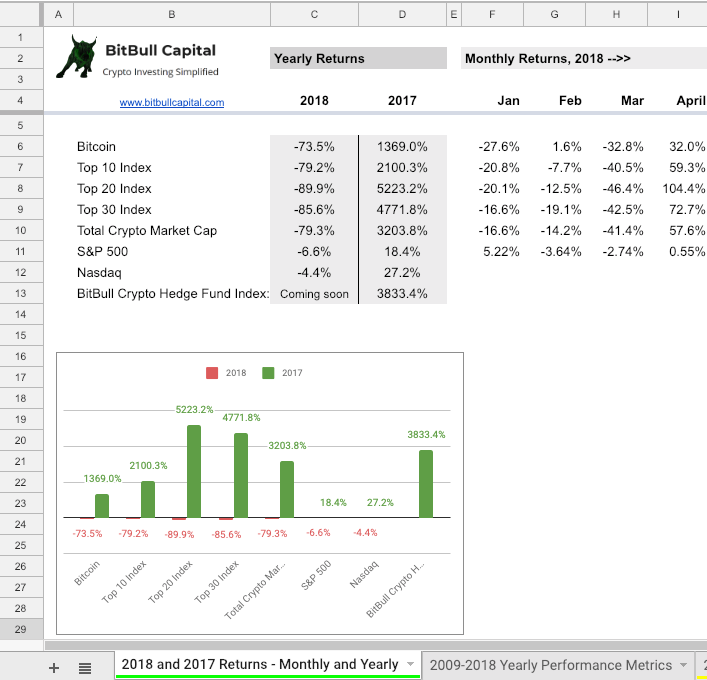 We compare crypto hedge fund returns against Bitcoin, crypto indexes, the dollar, and the S&P, and use a “cheat sheet” that compiles these returns. Today we are releasing this cheat sheet, so that others can benefit from a side-by-side comparison of Bitcoin vs Crypto Indexes and other crypto returns. Stay tuned for additional crypto return information, including aggregated information on crypto hedge fund returns, the BitBull Crypto Hedge Fund Index. 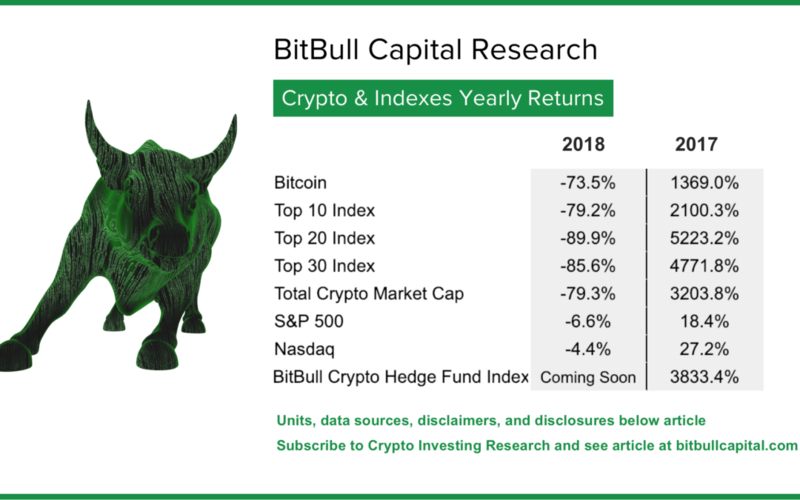 We’ve included the 2017 number for the BitBull Crypto Hedge Fund Index return, based off an average of the returns of several crypto hedge funds in that year. This will help provide data to answer: have crypto hedge funds performed better than Bitcoin and/or a crypto index? For those seeking consistent alpha, the returns in this index are sure to be interesting. A snapshot of our spreadsheet available here. After the 3204% surge we witnessed in 2017’s total crypto market cap, the bear returned in 2018, keeping the entire crypto market down, with the total market cap dropping 80% in 2018. The first major drop came in January (-16.60%), followed by March (-41.40%), after which there was relative stability, with a short-lived surge in April (+57.60%). However, prices continued to drop as expected developments were stalled, including the rejections of many proposed ETFs and scaling issues faced by Ethereum, the most popular cryptocurrency after Bitcoin. November then marked the biggest drop (-35.90%) since March, amidst the Bitcoin Cash fork controversy, while December was largely volatile leading up to the new year. Bitcoin hit a closing low of $3,236.76 on December 15, 2018, and ended the year at 3,742.70 , up 15.7% from its low. Interestingly, when compared with the top 10 (-79.20%) and top 30 (-85.60%) cryptocurrency indexes, Bitcoin has shown the most resilience, declining by 73.50%. These numbers reaffirm Bitcoin’s position as the leading crypto with relatively modest volatility. The top 30 crypto index also shows much more volatility than the top 10 crypto index. The dynamics behind Bitcoin’s influence on the market are multi-layered. Firstly, it is evident that all other cryptocurrencies, generally, follow Bitcoin’s price action – which means when Bitcoin appreciates, other currencies ‘typically’ appreciate shortly afterward. But, when Bitcoin drops, other cryptocurrencies ‘definitely’ follow suit; however, in both instances, the effects are amplified for altcoins. The case in point can be seen from numbers March to August, where Bitcoin dropped by 32.80% in March, but the top 20 index recorded a 43.90% decline. Similarly, when Bitcoin surged by 32% in April, the top 20 index appreciated by 93.50%. However, in July, Bitcoin’s increase of 26.60% was only followed by a 6.0% increase in the top 20 index. And when Bitcoin dropped by 5.9% in August, the top 20 index dropped 21.60% – which goes to show how the effects of a drop in Bitcoin price are more strongly felt in the market than a surge. The reason behind this influence is the fact that most cryptocurrency exchanges use Bitcoin as a primary market pair, against which all other cryptocurrencies are traded. This gives Bitcoin a unique dominance, as crypto holdings are measured in Bitcoin rather than the various altcoins. This effect is further propagated with Bitcoin being the cryptocurrency of choice when it comes to large institutional moves and developments, such as the launch of futures contracts, be it by CME, CBOE or Bakkt, all of whom pick Bitcoin as the first currency for new products. Is Bitcoin a Better Cryptocurrency to Hold? Bitcoin has been the least volatile and the first to recover when a bull cycle begins. However, once the market is in a recovery cycle, diversifying into promising altcoins, such as the ones in the top 20 or top 30 indexes, can be very profitable, since they tend to appreciate a lot more. Earlier this month, we published our report on Bitcoin being at a very strong buy point, and our reasoning is the same. At this price point, we believe Bitcoin is a very solid contender. As it recovers, the market should follow suit and appreciate considerably. Historically, this has meant even higher price appreciation for top alternative coins, but historical returns do not predict future returns. Bitcoin, and Ethereum, and Crypto Market Cap numbers for Dec 31, 2018 are exact, taken on Jan 1, 2018. Performance of an index is not illustrative of any particular investment. Performance prior to the inception date of each index represents a hypothetical, back-tested, and unaudited return-stream that does not represent the returns of an actual account. Index performance does not include the fees and expenses that may be charged by funds. Actual returns may differ materially from hypothetical, back-tested returns. 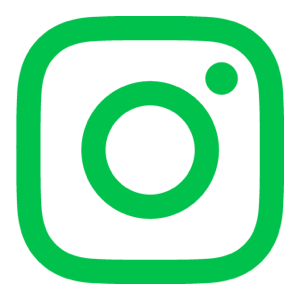 Back-testing is calculated by retroactively applying a financial model or Index-weighting methodology to the historical data to obtain returns.